pretty.pretty.paper: food worth traveling for. so in case you hadn't figured it out by now my food loyalties run strong. i think it is genetic. anyway i have a little tip for any and all of you living in or traveling to asheville, nc ... go to the admiral. apparently this little wonder of a restaurant has been open for just over two years now but i only happened upon it last night (one must love moms who know that daughters & sons-in-law are fond of food adventures). mas went so far as to say that it was very nearly as good as flatbread ... and you guys that is HUGE. flatbread has a special place in our hearts, duh, but their food is phenomenal so when you can get mas to compare anything to said restaurant, well dears, you know that the food they serve is worth traveling for. i have a feeling that mas will be making it on more of my asheville trips in the future. on our agenda for today, 12 bones, and oh yeah, vampire weekend, oof i love mini vacations! Isn't that place also a bar? I vaguely remember that as a place we stopped during the early hours of the morning in our "welcome to Asheville" night. But I had no idea I should go back there to eat.. yum!! That might need to happen.. soon. Oh my! My best friend is from Asheville, and I've visited a few times. 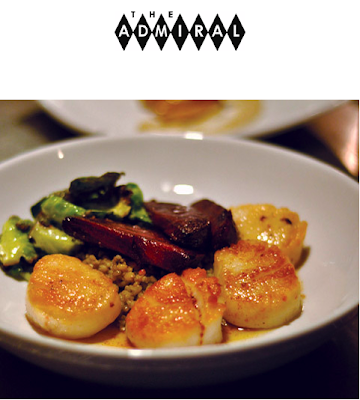 I will have to remember The Admiral- your meal looks to die for! And Vampire weekend? FUN! wish i was with you - we love the admiral and 12 bones. did you get the BLT? amazing!! go back again if you didn't get it. now my mouth is watering.